THE new DML 80 product line available from DMG Australia is a universal high-precision machine for laser processing with highest accuracy. Various applications of laser cutting in 2D and 3D, laser drilling and laser welding are possible due to the modular concept. 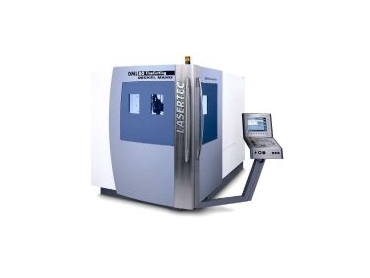 One of DMG's strong points was also made possible for this machine: the compact DML 80 can be equipped with 3, 4 of 5-axis or even pallet changer and allows excellent access to the workpiece and the laser source. These laser machines can be used in various industries, such as medical (endo surgery equipment, injection needles), electronics (etching, circuits, solder masks), mechanical engineering (valves, spinnerets, tools) and job shops (precision parts, prototypes). A special version is setting new standards in drilling of turbine plates. High machine accuracy, high positioning speeds and dynamics of the X/Y axes, the Z-axis with ball screw drive and the rotation axes with linear drives are just a few examples of the state-of-the-art design features. The X/Y support table with linear drives and the solid machine base with three-feet rest enables a smooth and accurate laser processing. The integration of different Nd:YAG or CO2 laser sources, simple maintenance due to easy access to the laser by a ergonomic base design are more examples of the machine concept.